Sharing my most festive holiday cake yet, the North Pole Cake. 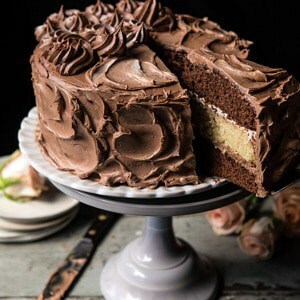 Three layers of buttery chocolate cake, layered with sweet chocolate ganache, and frosted generously with a browned butter vanilla frosting. 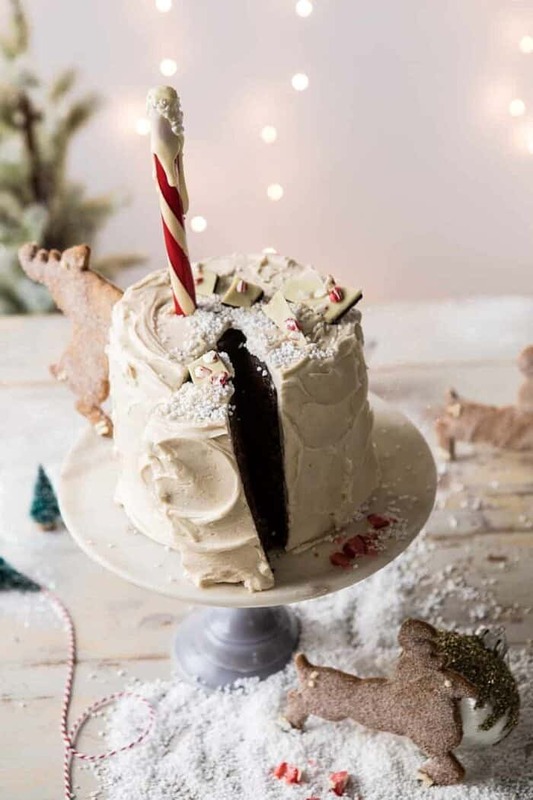 Finish the cake off with a frosting dipped candy cane “north pole” and you’ll have the cutest holiday cake, that’s beyond delicious too. I couldn’t let December pass by without sharing a festive holiday cake that’s both cute and delicious. As you can tell by now, I really like to do it up with the Christmas recipes. I have so much fun playing around with whimsical desserts. Enter the layer cake, one of my favorite recipes to date. I had two goals for this cake. First, make it good. Chocolatey on the inside, but with a nutty vanilla frosting on the outside. Second, make the cake feel as though you’ve entered the North Pole. 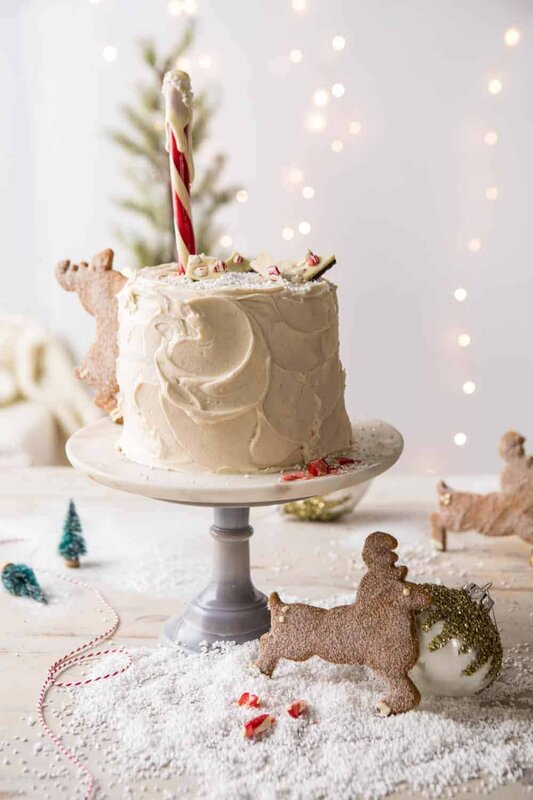 Meaning, create a winter wonderland cake that’s just as fun to make as it is to eat. For the base of the cake I actually tried a few different recipes before landing on a more simple chocolate cake. I really wanted my cake to be moist, chocolate filled, and have hints of sweet Land O Lakes® Butter. 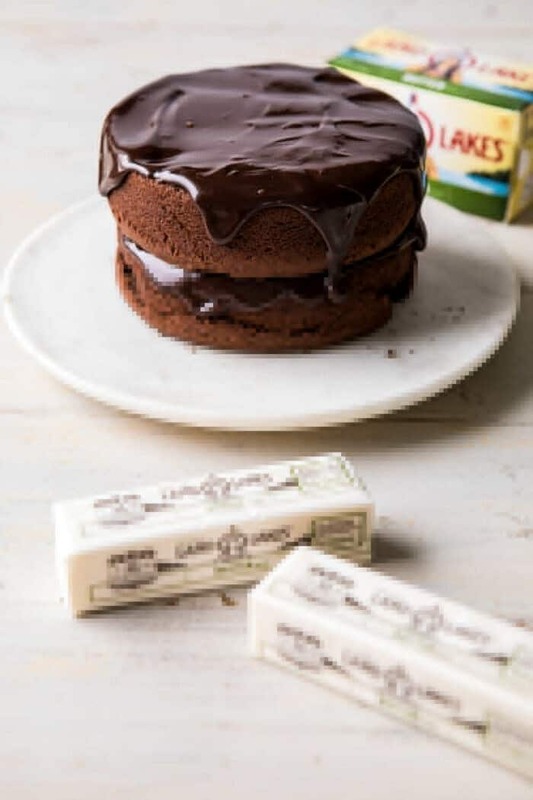 There’s nothing worse than a dry cake, so I love using Land O Lakes® Butter to keep my cakes extra light, moist, and flavorful. I baked my cake into three (6-inch) layer cakes. If you don’t own a 6-inch cake pan, you can also bake the cake in two (8-inch) cake layers. This works just as well, but you’ll have a shorter and wider cake, versus tall and skinny. I made a lusciously smooth chocolate ganache with semi-sweet chocolate and a touch of cream to spread between the cake layers. When you look at the cake, you’d never guess there’s so much chocolate inside, but when you cut the first slice, you’re pleasantly surprised to find multiple layers of chocolate deliciousness. I love this little surprise hidden inside…so fun! And then there’s the frosting. Oh, this frosting, it’s become my new go-to. Browned butter, a touch of mascarpone cheese, powdered sugar, and a splash of vanilla. Simple ingredients, but put them together and they make something incredibly delicious. This frosting is smooth, creamy, a little nutty from the browned butter, and perfectly sweet. Honestly, it doesn’t get any better. It’s important for me to make recipes that not only look good, but taste just as delicious, if not better. And trust me, there’s so much to love about this cake. It is a chocolate lover’s dream cake. But it’s also very much a cake for anyone who loves vanilla. To make the “North Pole” I just used a thick candy cane. I broke the rounded tip off, and then dipped it through a little of the frosting to make the top of the pole. I added some pearl sugar for a snowy effect, and pushed it directly into the top of the cake. Nothing fancy, but so special and cute. 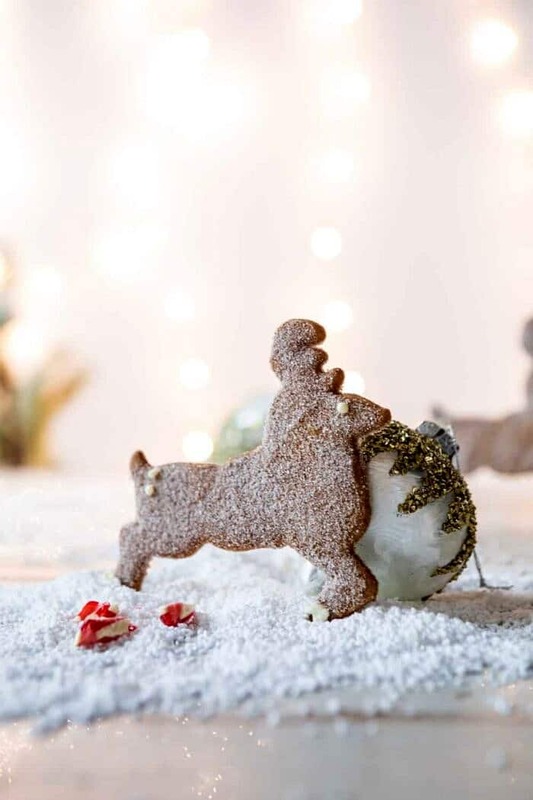 If you’d like to take the decorations a step further, you can make sugar cookie cut outs. I made reindeer sugar cookies. I sprinkled them with cinnamon sugar, and used a little melted white chocolate for their eyes and tail. It was important to me to keep the scene simple though, so that the cake would be the star. 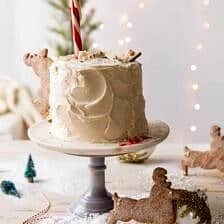 If you’re looking for a fun Christmassy weekend project, or need a show stopping cake for your next holiday party, this is definitely that cake! I’ll be making it for my family’s Christmas Eve and I’m already so excited. 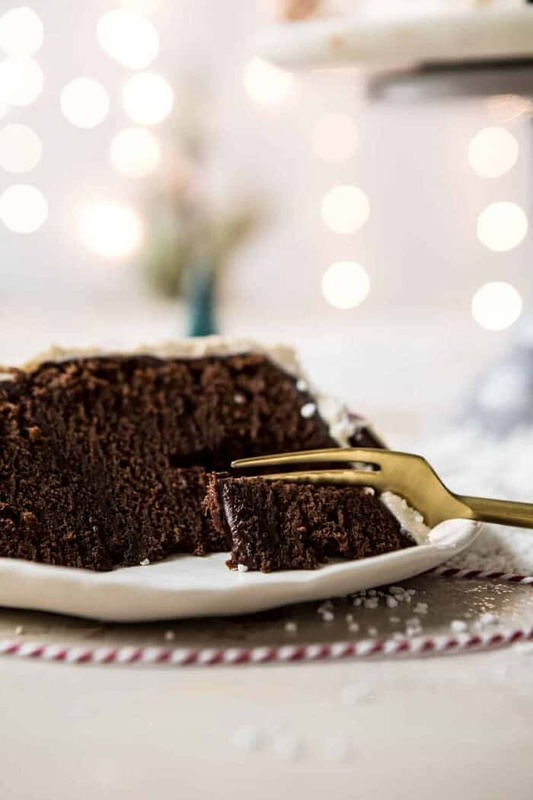 If you make this North Pole Cake please be sure to leave a comment and/or give this recipe a rating! Above all, I love to hear from you guys and always do my best to respond to each and every comment. And of course, if you do make this recipe, don’t forget to also tag me on Instagram! Looking through the photos of recipes you all have made is my favorite! 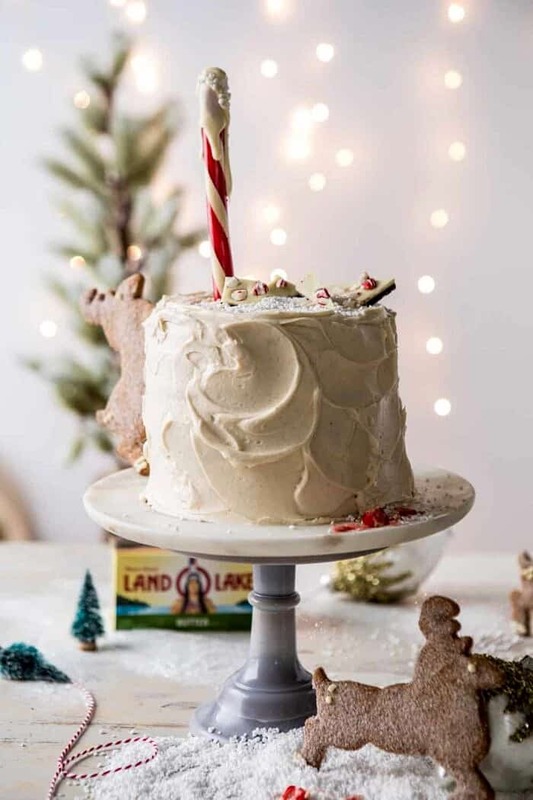 North Pole Cake from Half Baked Harvest on Vimeo. Sharing my most festive holiday cake yet, the North Pole Cake. Three layers of buttery chocolate cake, layered with sweet chocolate ganache, and frosted generously with a browned butter vanilla frosting. 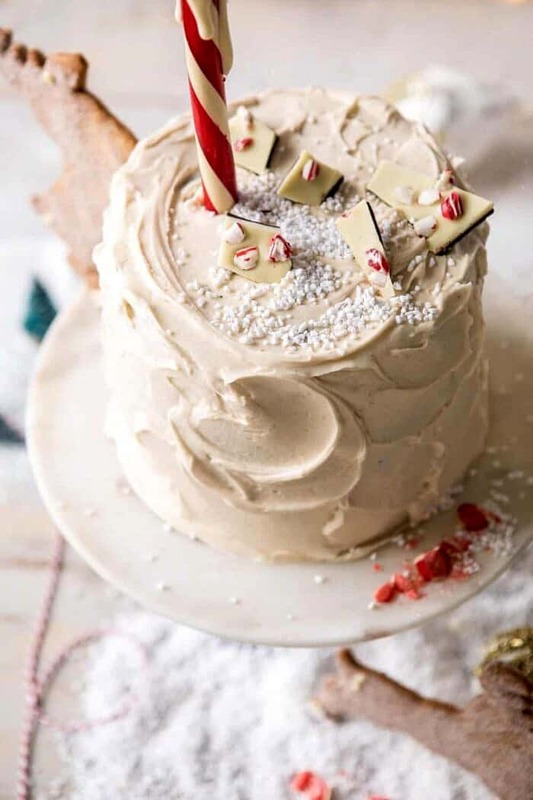 Finish the cake off with a candy cane "north pole" and you'll have the cutest beyond delicious holiday cake! 1. Preheat the oven to 350 degrees F. Butter 3 (6-inch) round cake pans or 2 (8 inch) round cake pans. Line with parchment paper, then butter. 2. In a medium size bowl, combine the flour, cocoa powder, baking powder, baking soda, and salt. 3. In the bowl of a stand mixer (or use a hand-held mixer) beat together the butter and sugar until light and fluffy. With the mixer on low, beat in the eggs, one at a time, until incorporated. Add the buttermilk, coffee flavored liquor (if using) and vanilla and beat until combined. Slowly add the dry ingredients to the wet ingredients with the mixer on low until just combined. Beat in the hot water. 4. Pour the batter among the cake pans and bake 30-35 minutes, until the tops are just set, and no longer wiggly in the center. Remove and let cool five minutes, then run a knife around the edges of the pan and turn the cakes out onto a cooling rack. Cover and let the cakes cool completely before assembling. 5. To make the ganache. In a microwave safe bowl, combine the heavy cream, butter, and chocolate. Microwave on power lever high for 30 second intervals, stirring after each interval until melted and smooth. Let the ganache cool 5-10 minutes. 6. To make the buttercream. Add 1 stick butter to a skillet set over medium heat. Allow the butter to brown lightly until it smells toasted, about 2-3 minutes. Stir often. Remove from the heat and transfer the butter to the mixing bowl, let cool until it's room temp. 7. Add the remaining stick of butter, mascarpone, and powdered sugar. Beat the butter and powdered sugar together until the butter is light and fluffy. Add the vanilla and beat until combined. 8. To assemble. Place 1st cake layer on a serving plate. Spread 1/2 of the ganache over the cake. Add the 2nd cake layer and spread with the remaining ganache. Add the 3rd layer. Frost the outside of the cake with a thin layer of buttercream. Chill 30 minutes and then frost the cake generously with the remaining buttercream. 7. Break the rounded tip off of the candy cane. Dip 1 end of the candy in buttercream to act as the tip of the "pole". Sprinkle the buttercream with pearl sugar. Insert the candy cane off-center on the top of the cake. Sprinkle with pearl sugar for "snow". Decorate as desired. Serve, or store in the fridge for up to 3 days. This is Raushan from India and I am a baker also run an online cake shop. On this Christmas, I am gonna try your recipe in my kitchen. Thanks for sharing your ideas with us. 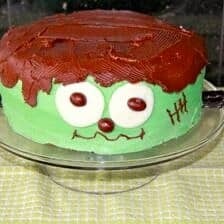 I hope this cake turns out amazing for you! Thank you so much! How much mascarpone cheese do you add to the frosting? In the description you mentioned adding “a hint” but the amount is not included in the ingredients. Looks decadently delicious! I can’t wait to make it! Thanks! A truly stunning edible winter wonderland! Is there supposed to be mascarpone in the frosting? It’s mentioned in the post but not in the recipe. Thanks! Beautiful! Also wondering how much mascarpone to put in the white frosting? I’d love to grab all the ingredients today and bake this weekend for company we have coming to town! In the comments above you mentioned you like to touch of mascarpone cheese, powdered sugar, and a splash of vanilla but I don’t see the madcapone Cheese listed in ingredients or in the directions. Then you for clarifying. Hi Connie! I will add it in! Thank you for letting me know! You mention mascarpone cheese in the text of your post but I don’t see it in the recipe! Hi Robin! I will update the recipe. So sorry about that! I hope you love this cake! Looks like a great cake but you mention mascarpone in the frosting but it is not included in the recipe? Hi Sharon! I will update the recipe. Thank you for letting me know! I hope you love this! Wow. Just wow. Can not wait to debut this cake this Christmas! Pinned! Yes! I hope you love this! Thank you Jess! Very cute and looks absolutely delicious. Hi Kelsi! This is so sweet! I am so glad you like this cake and other recipes on my blog! Thank you! This looks amazing!! How long do you let butter sit out so it’s soft enough? 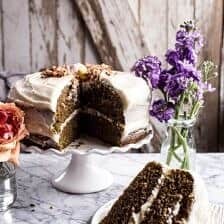 In the blog you mention there’s mascarpone cheese in the frosting but it’s not written in the recipe? I loveee mascarpone in frosting so had to ask if it should be there or not! 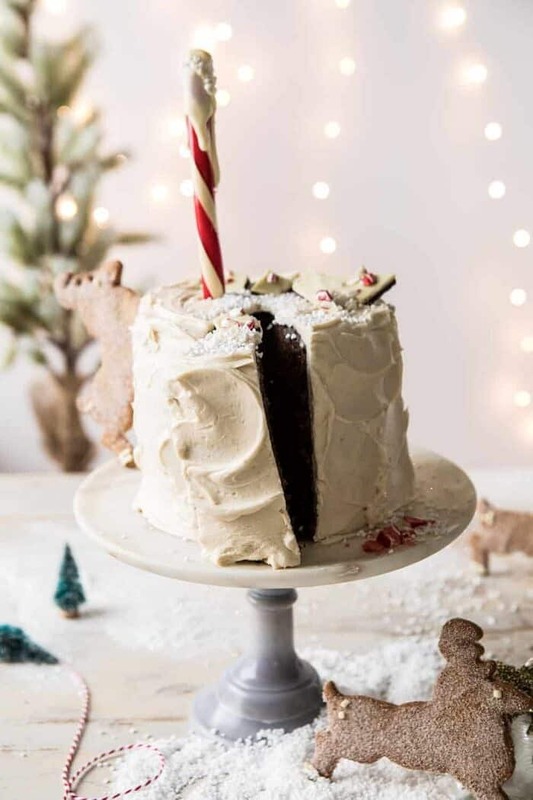 Such an adorably festive cake! Thank you Erin! I am so glad you like this! I just wanted to double check (because I thought it was unusual) that you are using SALTED butter and not unsalted in this recipe? Also, even with the salted butter, you’re adding some more salt to the cake? What an adorable cake Teighan! I like the idea of using three 6″ cake pans, it gives it such a look. I find myself using my 6″ cake pans more and more, a cuter look for my friends…..and me! LOL! Very nice touch with the reindeer cookies, brownie points!! 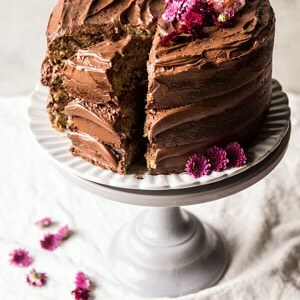 I’m so into all the chocolate in this cake….DEELISH!! Land O’Lakes butter is always in my frig, I’ve been using it for years and years. They do carry a variety of their butters, check out the dairy section next time you’re at your grocers. Thank you so much Dalila! I hope you try this cake and it turns out great for you! hey girl- this looks oh so tasty! yummy! Some people swear by oil-based chocolate cakes, but the best chocolate cake I’ve ever made – or eaten – uses butter! Lovely cake, looking forward to making it! I made this the other day and it was amazing! I don’t know why I’ve never made browned butter frosting before, it’s divine! Everyone loved the cake (even though I think I overbaked it by just a few minutes). Always enjoy making your recipes! Thank you Mandy! I am so glad you loved this cake! The recipe calls for cocoa powder, but in the directions, it doesn’t say when to add it. I assume with the other dry ingredients? Hey! Quick question…could I use brewed coffee in place of the extract? Can’t wait to make this recipe for Christmas dinner this year! I would need an 8 inch cake to feed everyone but love the height of a 3 layer cake. Should I make the recipe as it calls but then half it? So one and a half the recipe? I feel like doubling the recipe would be way too much batter. I made this as cupcakes, cause that’s my favorite way to consume cake, and just did the genache as a filling. I was surprised how much I loved the random chunks of peppermint bark. Such a surprising flavor combination. Quite tasty, good call! Thank you so much Brittanie! I am so glad you loved this recipe and in cupcake form! Hi Penny! I have a couple vanilla cake recipes! I will link one below that seems to be one of my family’s favorites! Hi! I’m making this tonight to serve on Christmas Eve! Once frosted, does it need to be refrigerated or can it be left out (in a cake dome) at room temp? I’m so excited to make this! Tieghan!!!!! So although we don’t do Christmas in my family, we do eat CAKE. So I made 1 1/2 of this recipe to make a 3 layer 8-inch cake (I think?) Anyway, I was REALLY focused on making sure my math for multiplying the recipe was correct. In the midst of that, along with allowing my 3 year old to do as much of the “making” as possible, I FORGOT THE HOT WATER. Needless to say, my cakes came out a little bit dry. But, the flavor was still there and the ganache and frosting were insane. Everyone loved them. I’ll come back and give a true rating after I’ve actually baked this with all the ingredients. Lol. Thanks! Thank you for trying this Kristen! I hope it turns out better for you next time, but I am glad everyone still enjoyed it! I made this cake for Christmas and it turned out beautiful. The cake seemed a little dry. Any suggestions? Hey Maggie! Was there anything you changed about the recipe? I made this for Christmas. It was absolutely gorgeous! The icing was off the charts and I’ll probably use it for future projects.. The cake had good flavor but was really dry. The best way to describe it would be similar to a Drake’s Devil Dog. I didn’t change a thing about the recipe. I hope you have a happy new year and I’m looking forward to seeing your ideas for 2019! Hi Denise! I am so glad you liked this cake! Thank you so much for trying it out! Hi Tiegen! I made this cake for Christmas and everyone thought it was phenomenal!!! I loved the frosting and will use this recipe for future cakes and cupcakes. What a unique idea to brown the butter creating a wonderful nutty taste along with the marscapone cheese. Loved it! !